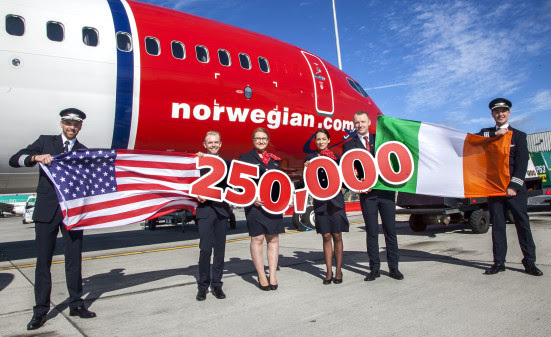 Best low-cost airline in Europe and World’s best low-cost long-haul airline, Norwegian has announced it has reached an important milestone in its continued growth at Dublin Airport by flying more than 250,000 transatlantic passengers to and from the New York and Boston areas since launch. The airline’s affordable flights to smaller airports near two major US east coast cities has generated strong demand among Irish and American consumers. 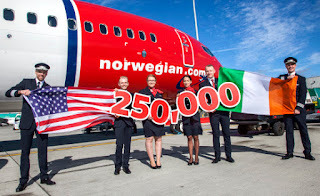 Norwegian is the only airline in Ireland to operate nonstop flights to New York Stewart International Airport and Providence International Airport, Rhode Island and will increase its weekly transatlantic flights from Dublin next summer by 33 per cent with the addition of a brand-new daily service to Hamilton (Toronto) Canada from 31 March 2019.